The basketball news from Limoges this week was about the return of Awa Gueye (left) from the injured list. The club was also talking about the possible return of Johanna Tayeau to the starting line-up after almost two months out. This match was one of the games from round 14 that was postponed due to the bad weather in December. Limoges decided to have the game played at the "Palais des Sports de Beaublanc" with the hope of attracting a larger crowd. Tayeau made her return to the starting five for Limoges and opened the scoring with the first attack of the game with less than 10 seconds played. Tarbes scored through Anne Breitreiner (right) on their first attack. Aikaterini Spatharou and Frida Eldebrink exchanged baskets (2 + 3) as both sides remained perfect (7-7). Tarbes stepped on the accelerator with Fatimatou Sacko and Emma Randall combining for 7 quick points. However Limoges did not collapse with Erica Davis and Pelagia Papamichail (below) finding their way to the basket. 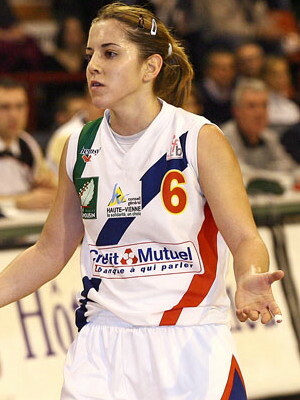 Breitreiner then went on a one-lady show and scored 8 points as Tarbes started to take hold of the game. The entry of Isabelle Yacoubou-Dehoui and Pauline Jannault enabled Tarbes to end the first quarter with a 10-point lead (27-17). Tarbes appeared to be running away with the game early in the second quarter when they went 14 points clear. Yet the Limoges Greek connection came up with some magic which put Tarbes on the back foot. Tarbes went into the locker room in front (47-39). Tayeau opened the scoring after the break. Then Davis scored for Limoges to trail by just 4 points with less than one minute played in the quarter (43-47). Once again Breitreiner went on the rampage and scored 7 points, pulled down a couple of rebounds, made a steal and was credited with an assist in a 11-1 run for Tarbes (58-44). Jannault (left) was having a field day from beyond the arc. Randall was back in the form that made her top scorer in the LFB last season while Tarbes went into the final quarter leading (66-50). Then Limoges came storming back with Gueye scoring 4 times from beyond the arc (64-70) with five minutes left to play. The turning point of the game came after a trey by Jannault. The match was held up for three minutes as the officials spent time explaining why the basket was allowed. Limoges were not the same after the unforced time-out and were unable to get back into the game. Eldebrink who was not having a good shooting day hit a trey as Tarbes regained the 10-point advantage (76-66). Limoges fired shot after shot during the last four minutes with not much success. Florence Lepron who had to play for the full 40 minutes sealed the victory for Tarbes with a pair of free-throws (82-70). Breitreiner and Jannault finished on 17 points to lead the Tarbes attack while Randall and Yacoubou-Dehoui scored 13 and 10 points each. For Limoges Gueye finished with a game high 21 points. Papamichail contributed 16 points while Spatharou (picture above - 10 assists) and Tayeau scored 10 points each. François Gomez was satisfied that his team won but not too pleased with some parts of his team's game. He said "They are sometimes too nice, when they make a mistake, they say sorry my fault, but then they commit the mistake again, that has to stop." He also explained that it was a pity that Limoges did not have the same team at the beginning of the season, because if they did they would not be in the relegation zone. Bertrand Parvaud believed that they could have won the game and despite the defeat the team had improved and the players should be happy with the performance. He was also hoping with the return of Kerline Verjuin next week he should have an additional player on his bench.